The build-up for Avengers: Endgame continues. And now, Marvel collaborator and artist Matt Ferguson has offered his take on the saga with a pair of exclusive posters. As part of a deal with Odeon Cinemas, Ferguson presented the posters on Twitter. 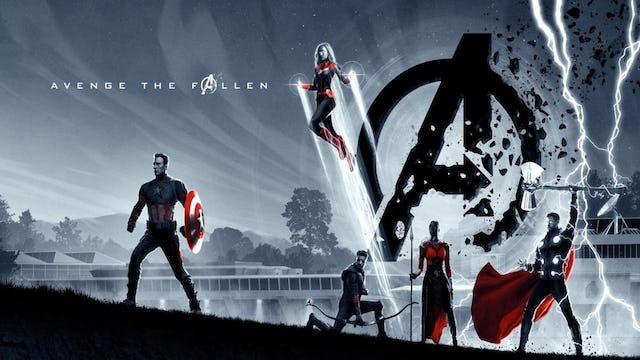 They feature a number of surviving characters in Endgame, posing dramatically alongside a crumbling Avengers logo. The full image is below, provided by Ferguson’s Twitter account. On one poster, we see Captain America standing by himself. Captain Marvel, Hawkeye, Ant-Man (on Hawkeye’s bow), with Okoye right beside them. Thor rounds out the group, while using his Stormbreaker hammer to summon lightning from the sky. The second poster includes Bruce Banner in the Hulkbuster armor, with War Machine, Nebula, Black Widow and Rocket Raccoon geared for battle. Finally, we have Iron Man, who stands apart from the group, ready for Thanos. In case you missed it, the Avengers headquarters is right behind the groups. This location could play a pivotal part in the battle against Thanos, as we’ve seen in trailers thus far. Fans in the United Kingdom will be able to pick up these posters at their local Odeon Cinema theaters. The first will be available from April 25-28, while the second is available in a more limited window, between May 4 and 5. Fans can simply book their reservations online to guarantee a poster alongside their ticket. On top of that, Ferguson also got some all-star help with the poster reveals. Paul Rudd (Ant-Man) and Scarlett Johansson (Black Widow) showed them off during a recent interview, which you can see in the tweet below. Johansson was able to locate her character pretty quickly. Rudd, however, needed some help from the interviewer to find his character. There’s no word if we’ll get the posters to some capacity here in the U.S., but you never know. We’ll keep those fingers crossed. Avengers: Endgame hits theaters on April 26. What do you think of these UK exclusive posters? Let us know in the comments below!